In an area that stretches from the Florida coast to Bermuda to Puerto Rico, the infamous Bermuda Triangle -- also known as the Deadly Triangle or Devil's Triangle -- has been blamed for hundreds of shipwrecks, plane crashes, mysterious disappearances, craft instrument malfunctions and other unexplained phenomena. Author Vincent Gaddis is credited for coining the term "Bermuda Triangle" back in 1964 in an article he wrote for Argosy magazine, "The Deadly Bermuda Triangle", in which he cataloged many of the anomalous events in the area. Several other authors, including Charles Berlitz and Ivan Sanderson, have added to their number. Whether or not phenomena of a paranormal nature are taking place there has been a matter of debate. Those who are convinced something odd is happening, as well as researchers who take a scientific view, have offered a number of explanations for the mystery. Fortean researcher Ivan Sanderson suspected that the strange sea and sky phenomena, mechanical and instrument malfunctions, and mysterious disappearances were the result of what he called "vile vortices." These areas are places with extreme currents and temperature variations, affecting electromagnetic fields. And the Bermuda Triangle wasn't the only place on earth where this occurred. Sanderson drew out elaborate charts on which he identified ten such locations precisely distributed around the globe, five above and five below at equal distances from the equator. This theory, proposed by the Coast Guard over 30 years ago, states: "The majority of disappearances can be attributed to the area's unique environmental features. First, the 'Devil's Triangle' is one of the two places on earth that a magnetic compass does point towards true north. Normally it points toward magnetic north. The difference between the two is known as compass variation. The amount of variation changes by as much as 20 degrees as one circumnavigates the Earth. If this compass variation or error is not compensated for, a navigator could find himself far off course and in deep trouble." 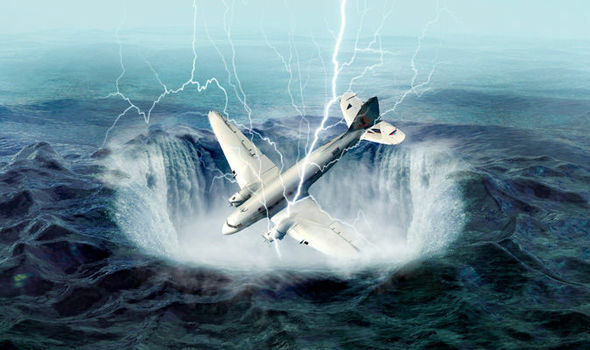 It's been suggested that from time to time a rift in space-time opens up in the Bermuda Triangle, and that planes and ships that are unlucky enough to be traveling the area at this time are lost in it. That is why, it is said, that often utterly no trace of the craft -- not even wreckage -- are ever found. Is an "electronic fog" responsible for many of the unexplained incidents and disappearances in the infamous Bermuda Triangle? That is the assertion made by Rob MacGregor and Bruce Gernon in their book The Fog. Gernon himself is a first-hand witness and survivor of this strange phenomenon. On December 4, 1970, he and his dad were flying their Bonanza A36 over the Bahamas. En route to Bimini they encountered strange cloud phenomena -- a tunnel-shaped vortex -- the sides of which the plane's wings scraped as they flew. All of the plane's electronic and magnetic navigational instruments malfunctioned and the magnetic compass spun inexplicably. As they neared the end of the tunnel, they expected to see clear blue sky. Instead, they saw only a dull grayish white for miles -- no ocean, sky or horizon. After flying for 34 minutes, a time corroborated by every clock on board, they found themselves over Miami Beach -- a flight that normally would have taken 75 minutes. MacGregor and Gernon believe that this electronic fog that Gernon experienced may have also been responsible for the famous disappearance of Flight 19, and other vanishing aircraft and ships. When in doubt, blame aliens in their flying saucers. Although their motives are unclear, it has been suggested that aliens have chosen the Bermuda Triangle as a point at which to capture and abduct for unknown purposes. Aside from the lack of evidence for this theory, we have to wonder why the aliens would take whole aircraft and ships -- some of considerable size. Why not just abduct the occupants in the same way they are said to take people from their homes in the dead of night? And when the UFO theory doesn't work, try Atlantis. One of the postulated locations for the legendary island of Atlantis is in the area of the Bermuda Triangle. Some believe that the Atlantians were a civilization that had developed amazing advanced technology, and that somehow remnants of it might still be active somewhere on the ocean floor. This technology, they say, might interfere with the instrumentation on modern ships and planes, causing them to sink and crash. Proponents of this idea cite the so-called "Bimini Road" rock formations in the area as evidence. Yet there seems to be no evidence for the advanced technology -- except, perhaps, for the incredible claim of a discovery made by Dr. Ray Brown in 1970 while scuba diving near the Bari Islands in the Bahamas. Brown says that he came upon a pyramid-like structure with a smooth, mirror-like stone finish. Swimming inside, he found the interior to be completely free of coral and algae, and was illuminated by some unknown light source. In the center was a sculpture of human hands holding a four-inch crystal sphere, above which was suspended a red gem at the end of a brass rod. The Bermuda Triangle's deaths and disappearances are the consequences of a curse, theorized psychiatrist Dr. Kenneth McAll of Brook Lyndhurst in England. He believed the area may be haunted by the spirits of the many African slaves who had been thrown overboard on their voyage to America. In this book, Healing the Haunted, he wrote of his strange experiences while sailing in these waters. "As we drifted gentle in the now warm and steamy atmosphere, I became aware of a continuous sound like mournful singing," he wrote. "I thought it must be a record player in the crew's quarters and as it continued through a second night, I finally, in exasperation, went below to ask if it could be stopped. However, the sound down there was the same as it was everywhere else and the crew were equally mystified." He later learned how in the 18th century, British sea captains defrauded insurance companies by tossing slaves into the ocean to drown, then cashing in on a claim for them. Perhaps all of the disappearances, malfunctions and accidents are no mystery at all, according to The"Mystery" of the Bermuda Triangle. "A check of Lloyd's of London's accident records by the editor of FATE magazine in 1975 showed that the Triangle was no more dangerous than any other part of the ocean," the article states. "U.S. Coast Guard records confirmed this, and since that time no good arguments have ever been made to refute those statistics. Even though the Bermuda Triangle isn't a true mystery, this region of the sea certainly has had its share of marine tragedy. This region is one of the heaviest traveled areas of ocean in the world. With this much activity in a relatively small region, it isn't surprising that a large number of accidents occur."